Failure to properly satisfy valid data subject requests can result in hefty fines for an organization. Infringement on data subject rights triggers upper-level penalties that include administrative fines up to 4% of annual global turnover or €20 Million (whichever is greater). Also, individuals may claim compensation from the business for any damages suffered due to a violation of their data subject rights. 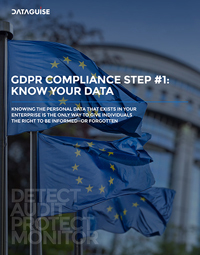 Given the processing challenges and violation penalties, enterprise businesses that are subject to GDPR law require efficient and reliable solutions in order to safeguard their entire organization from mishandling data subject rights requests. The Data Subject Rights module within Dataguise’s DgSecure software integrates with back-end operations, allowing organizations to streamline processing for data subject rights. Quick Integration: Available interfaces allow quick integration with customer portals, back-end lists of Data Subjects, and enterprise repositories. Automation: Once integrated with back-end data, the module provides the necessary functionality for enterprise organizations to automate processing for data subject rights. Ease-of-Use: Running tasks in the module is simple, requiring only a few clicks from the very intuitive user interface within the DgSecure dashboard. Accuracy: Using DgSecure’s element-level data discovery tools, the module provides unsurpassed accuracy locating and identifying all personal data to be processed for a request. Peace-of-mind: With over a decade of industry-leading technology, rest assured DgSecure safeguards your organization for data subject rights compliance. 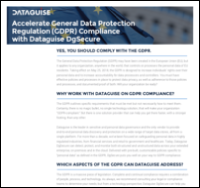 To learn more about how DgSecure’s Data Subject Rights module is safeguarding enterprise organizations by automating data subject rights, contact us today.